I am a second-year graduate student in Dr. Peggy Fong’s lab at UCLA conducting research on an invasive algal species, Sargassum horneri. This summer I was studying this invasive species at the Wrigley Institute as a Wrigley Summer Fellow. This experience hasn’t always gone to plan (which can happen with research! ), but I wanted to share some things that I’ve learned. First, a little bit about my study species. Sargassum horneri was first found in Long Beach Harbor in 2003, but since that time it has spread over much of southern California. During the 2015/16 El Niño, S. horneri expanded rapidly on Catalina Island. 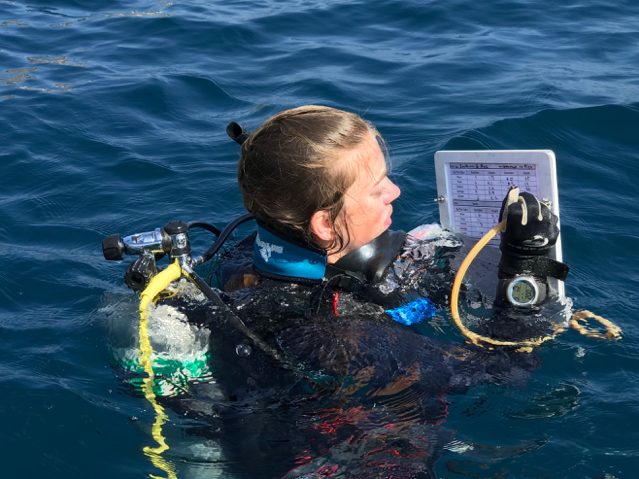 Because El Niño’s are characterized by warming waters off the coast of California, I became interested in examining competition between Sargassum horneri and native algal species under ambient and elevated sea temperatures. I hypothesized that Sargassum horneri would be a better competitor when the waters were warmer. To do this, I created mesocosms (controlled outdoor experiments) using jars that would each house a different combination of algal species (10 invasive only, 10 native only, and 10 native + invasive). These jars would then be divided evenly into ambient or elevated temperatures. The elevated temperature jars would each have an aquarium heater set to 2 degrees above the current sea temperature. At the end of the experiment, I would compare growth of the plants between the different treatments. (Image 1) The experimental jars. Each one has water flow to ensure a constant turnover, a min/max thermometer to ensure the temperatures don’t fluctuate between jars, and algae growing inside. Image 2 and 3; (Image 2) A closeup view of the jar including the min/max thermometer, heater; (Image 3) algae, and temperature logger. However, my experiment was somewhat foiled by the heat! This was a warm summer and the sea temperatures became pretty high when I began this experiment. In fact, over five days the bottom temperature at 25ft increased 4.38 °C, that is almost 8 degrees Fahrenheit! Which meant raising the temperature with my aquarium heaters would kill most of the algae (I know this because I pulled out some pretty gross moldy algae!). This is the change in temperature of the water at 25 feet from August 3rd to August 8th, 2018. I kept trying to get my experiment up and running, however in the meantime, I expanded my project to include a field component. 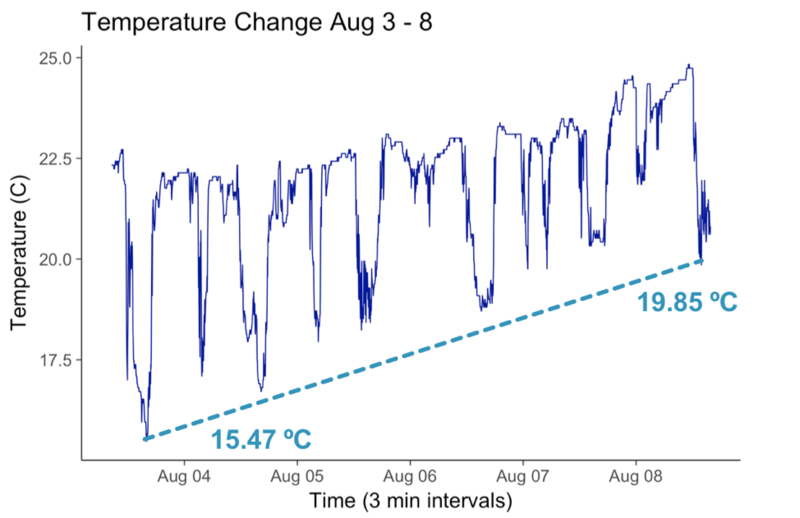 Since the temperature fluctuated quite a bit over the summer, I decided to determine if that heat was having an impact on invasive Sargassum horneri growth in the wild. At three sites around the Wrigley Institute, I tagged 30 individuals and set out temperature loggers at all three sites. Every five days, my dive buddy and I went out to these sites, found the tagged algae and measured the growth so I could plot the average temperature and see if it was linked to growth. After collecting the height and width of the marked Sargassum horneri individuals I am updating my dive slate with the site information. 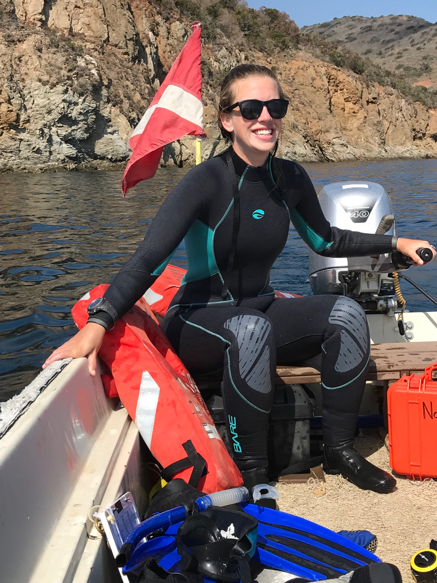 Although my experiment didn’t go exactly the way I planned, I’ve had a wonderful time on Catalina Island and been able to expand my project in ways I hadn’t thought of before I arrived. This entry was posted in Wrigley Institute on October 18, 2018 by Jessica Dutton.